For the knitting newbie, there is something magical about how those needles go flying through the string and somehow make amazing patterns which in turn create whole garments. It’s sheer genius! Knitting is not as hard as it looks and with a bit of practice, you could get just as good. And you won’t even be taking half the time to get it all done. That said, there is still some skill required for knitting. Happily, this isn’t too hard to learn so you can do it yourself. The only things you’ll need are knitting needles and yarn and you are ready to begin. There are several basic knitting stitches that you will need to learn. Once you have these down, all you have to do is connect them and keep at it. Of course this could take a while to pick up if you worry about the length of the project. However, if you stick with it, knitting could provide you with hours of entertainment and/or peace and quiet to gather your thoughts – plus you get something handmade to wear or gift to someone. What a beautifully warm and chunky pattern that combines the idea of infinity scarves with double crochet stitching! All you need to do is pull of a double chain stitch and blend it with more double stitches, finally slip stitching the ends and what you achieve is a wonderful scarf that won’t take more than a day to get all set. 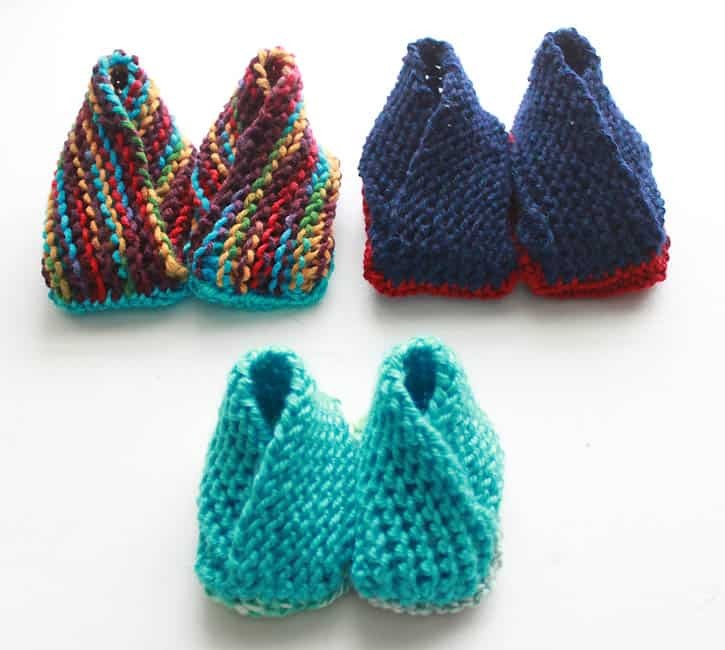 Bring so much more coziness and comfort to your little one’s delicate feet with these baby booties knit at home that come with a little dose of your love too. That adorable vintage button going for the strap of the boot complements the cozy piece of accessory just perfect. It’s all about using a basic knit stitch to put the booties together. 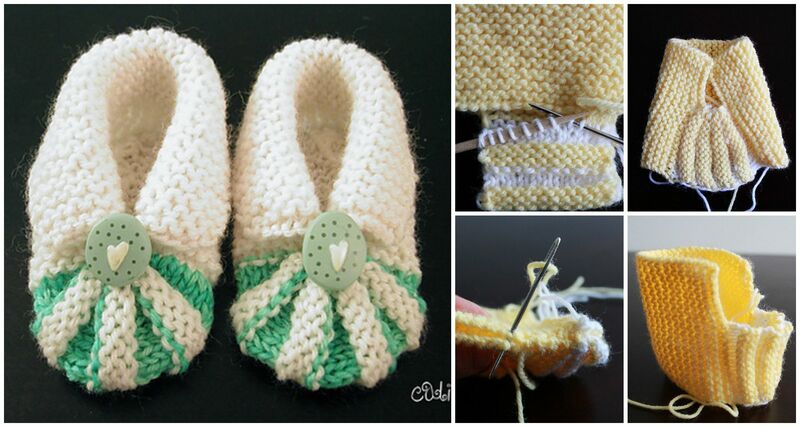 One absolutely must make these knitted baby booties adorned with a lovely ribbon for their little ladies. Calling for the most basic of knitting skills, the boots are a work of the knit and slip stitch, along with lazy daisy stitch that’s used for the decoration details. You will need some double-pointed needles, and your choice of yarn. Supercute is the word for these crochet cuffed baby booties embellished with buttons or crochet flowers on the sides. Playing a little with the traditional baby boot crochet patterns, this inspiration by Repeat Crafter Me, worked out in a two-toned color combination of cozy yarn is a surprisingly easy to put together affair. The fact that makes these vibrant-looking, modern knitted baby uggs quick and effortless to make is that they are knit in one single piece. In other words, there aren’t any seams or ends required to weave. While you can always go for your choice of yarn, wither cotton or wool would work wonders for getting the project done. Designed specially for newborn babies ranging from 3 to 6 months, these baby booties have been crafted with merino wool to keep those tootsies a little extra warm and cozied up during the chilly winters. An added touch of style comes from the cabled pattern in the front that brings out great texture to the overall design. Screaming out minimalism out loud, these little easy knit baby booties begin with three square of knitting that have been innovatively assembled into fold-over boots when joined together. A set of bamboo knitting needles in size US 8, some machine washable yarn that matches the needle size, and a large-eyed tapestry needle are all you need. Yet another knitting pattern that takes you through making crossover baby booties, this one integrates cute little buttons to the front to make the boots hold the young feet a lot better, while also making them look even more adorable. While one of the buttons here is shaped like a star, the other looks like the moon, adding a fairytale element to the pair. 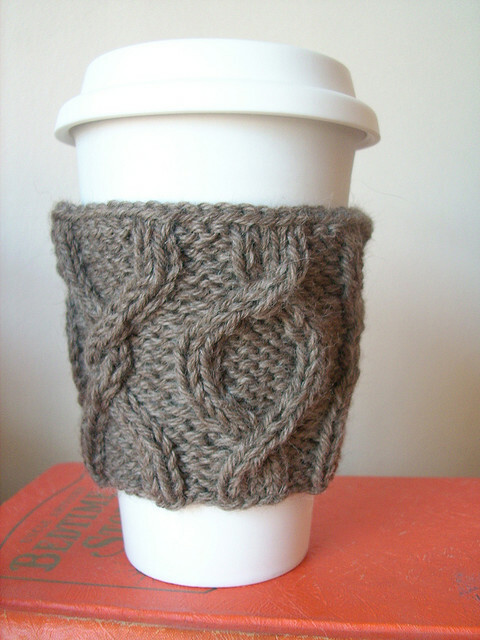 If you are madly in love with having a warm cup of coffee during cold mornings, a nice coffee cozy won’t only keep your coffee hot for longer, but also make sure you don’t burn your hands while holding the glass. A sheet of knitted yarn is wrapped around the glass, having little button holes go on one end, while stylish buttons go for the other. Wouldn’t it be amazing to have an ultra-warm shrug double up as a scarf too? This cowl sweater shrug wrap does exactly that – all with an easy-to-do knitting pattern shared by Knit + Bake with the help of a detailed video tutorial. 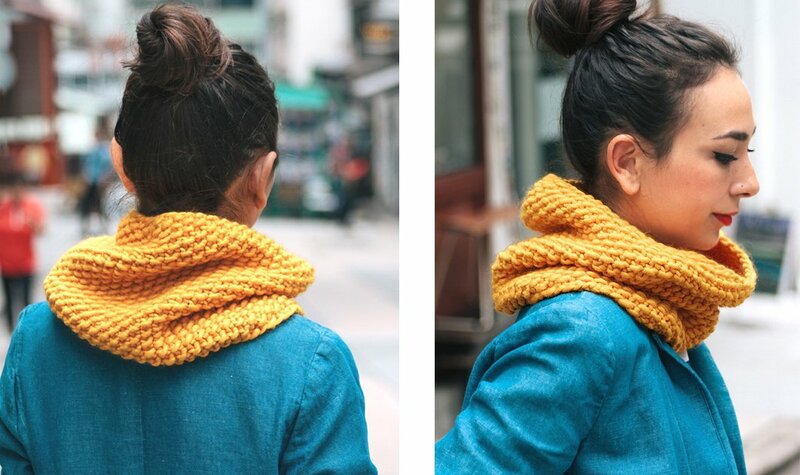 Wear it as a scarf and simply wrap it around the shoulders when you want to pamper them with some warmth. 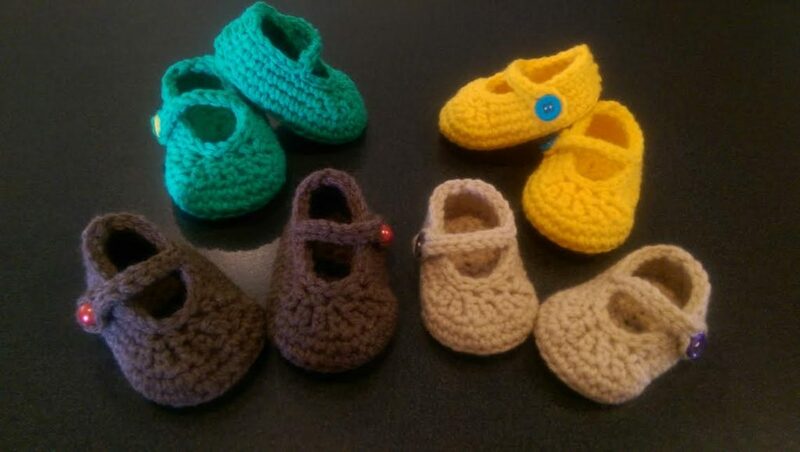 Fitting the tiny feet of a newborn infant up to a six month old child, these baby booties give all the credit for the customizing abilities to that thin and lacy ribbon on the top. All you need to do is pull the ribbons to alter the size of the boot according to the feet and the simple-knit accessory is going to hit all the right notes. Make the special man in your life feel a little special, and of course, cozier during the winters with a homemade cowl that you crafted exclusively for him. You are going to need size 13 circular needles to get the pattern going, as well as a darning needle to work out the ends of this super comfy striped cowl. 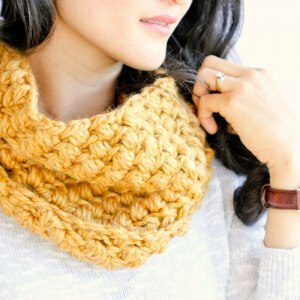 Ditch the whole idea of cloth seams with this single piece of coziness, a seed stitch cowl that lets you knit all around. Apt and appropriate for beginners, seed stitch is an utterly simple yet amazing stitching technique that builds beautiful, easy-to-knit stitches with a nubby texture. Laying flat and being fully reversible, this one is a must-have. It surely won’t be an overstatement to call this crochet cozy for keeping your hot water bottles even hotter a complete masterpiece. Built using the chain stitching knitting pattern, the double-toned bottle cover comes with different colors for the cover and the chain. Great to charm the bottle with, it’s an equally wonderful gift to present. 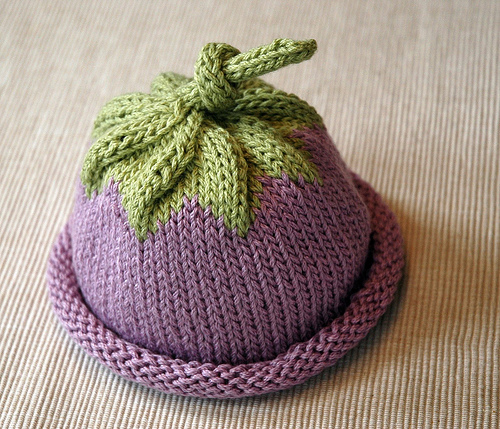 We bet your newborn will fall in love with a fruitylicious home-stitched hat! The subtle yet clever blending of colors that differentiates the leaves from the berry for this berry-inspired baby hat makes it even more adorable. 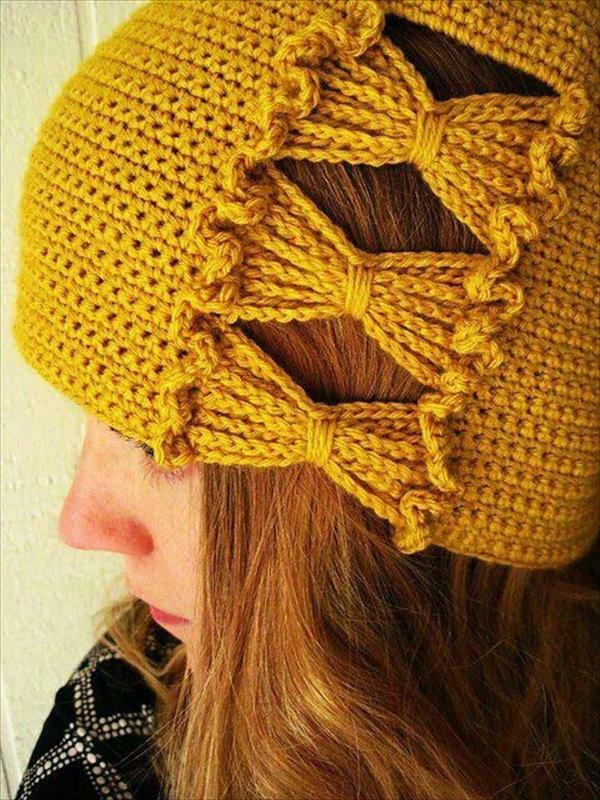 The knitting pattern for the hat shared by Random Stitches comes with a lovely top-knot. Who said that knitting stuff has to be limited to clothing and winter accessories only? 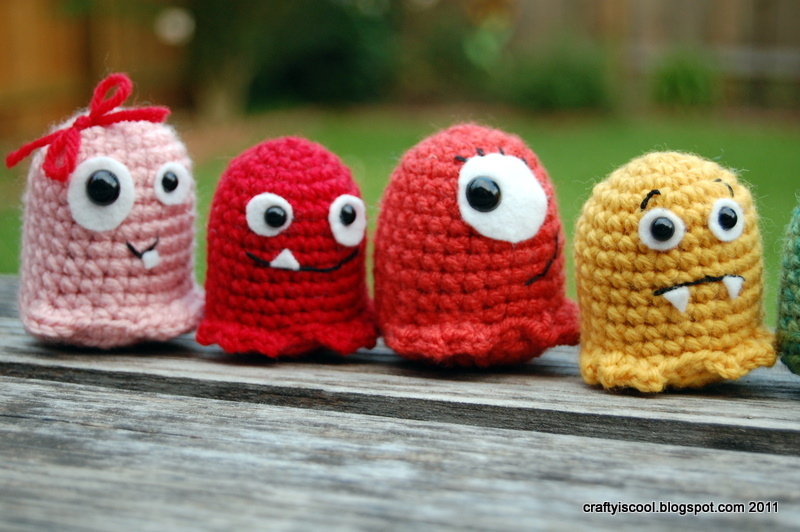 These baby monsters quite rightly explain what a winsome creation can be worked out with colored yarn. Pieces of white felt and some buttons go for the googly eyes of these little toys that have crochet stitching in a little tube and some stuffing as their foundation. 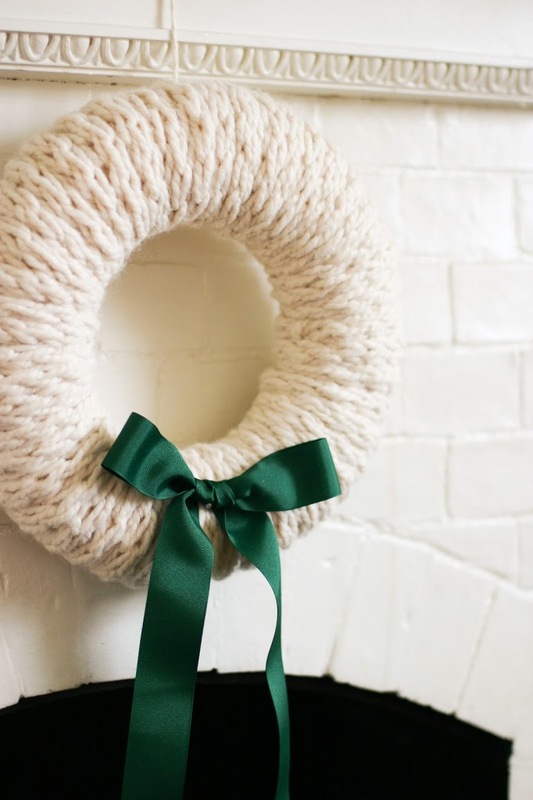 Front door decorations are quite a significant part of the holiday decor, and a warm woolen wreath like this one can bring the perfect welcoming charm to your home for the winters. The best thing here is that you pull off the whole piece with the finger-knitting technique, adding the final touches with a ribbon bow at the bottom. Those beautiful twists and turns brought to the coffee cozy by stitching the yarn with a dose of creativity makes it standout with sheer grace. While this inspiration keeps things monochromatic, you can always add more colors to the twisted pattern and make your coffee cup work as an even better focal point when donning the handmade cozy.